Wrestling Fan Hopes for Mariners’ May-Nia! EAGLE-eyed wrestling fans were in for a surprise in the early hours of Monday morning as a flurry of Grimsby Town themed signs appeared during the World Wrestling Entertainment (WWE) Fast Lane show in Memphis, TN. THE VANARAMA Conference title race is well and truly on after Grimsby Town sent long-time leaders Barnet spiralling to a second successive defeat after an excellent 3-1 victory in this televised clash at Blundell Park. Martin Allen’s side looked to be on their way to another victory after top scorer John Akinde netted a sixth-minute penalty but that lead was overturned within ten minutes thanks to strikes from Ollie Palmer and Lenell John-Lewis’ own spot kick. A SECOND-half brace from top scorer Lenell John-Lewis returned Grimsby Town to winning ways against a Woking side led by manager Garry Hill, who branded the hosts the ‘worst Grimsby side he has seen’ in his post-match interview. INJURIES to first-choice strikers Lenell John-Lewis and Jon-Paul Pittman helped pile on the misery for Grimsby Town as they slumped to a 2-0 home defeat against Torquay United. First half goals from Courtney Richards and Luke Young were enough to send the hosts to a second successive defeat, despite a spirited second half comeback, and make it a happy homecoming for Cleethorpes-born boss Chris Hargreaves. 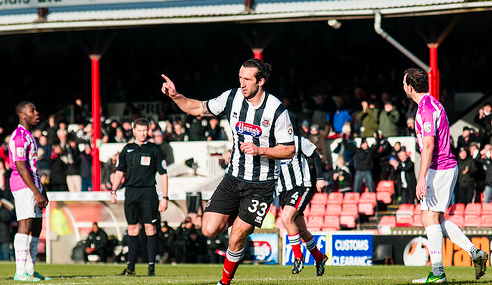 REFEREE Robert Whitton took centre stage as Grimsby Town’s unbeaten start to the 2014/15 Vanarama Conference season came to an end after a 2-1 defeat at Aldershot Town. The 35th-minute sending off of striker Lenell John-Lewis swung the match in the hosts’ favour, after the Mariners had dominated the opening exchanges. And Brett Williams’ second half brace ensured the three points stayed in Hampshire, despite Scott Neilson’s late strike sparking a spirited Mariners’ comeback.